BBC Two - Trust Me, I'm a Doctor, Series 5, Episode 2 - How can I improve my balance and core strength? Our sense of balance is something we tend to take for granted – until we are trying to perfect our surfing or snowboarding... or find ourselves regularly taking a tumble. In fact, it is so important that our brains and body work hard to stop us noticing how much it is declining, until we have problems with our eyesight, which we use to compensate for our actual balance organs. 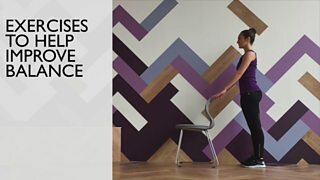 You get a sense of just how good your sense of balance really is by attempting to balance on one foot with your eyes closed: Bend one knee and lift the foot — if you’re right-handed, stand on your left leg and lift the right foot; you don’t need to lift it high – about 6 inches off the floor. Do this with a hand very near something ready to steady yourself in case you fall! The chart below shows how long you should be able to keep this up for, without falling over or having to put your foot down. Target time for standing on one food with your eyes closed based on your age category. Our balance is primarily controlled by something called our vestibular system: a complex series of tubes and chambers in our inner ear. These are filled with fluid that sloshes around, affecting nerve endings which detect the position and movement of the head. But studies have shown that the number of nerve cells in the vestibular system decreases from about age 55, and blood flow to the inner ear also decreases with age. This might help explain why falls are one of the biggest health worries for people over 60. According to the NHS 1 in 3 adults over 65 will fall at least once every year, which can lead to significant injuries such as hip fractures and is the leading cause of injury-related deaths in over people over 75. But the good news is that it’s never too late to improve your sense of balance. Balancing exercises also help improve your core, which acts as your body’s inner stabiliser, and when you do that you improve your posture and coordination and that helps avoid injury and can improve your performance at sports. The idea of balance exercises is that by lessening the amount of contact you have with the floor, or by looking away from where you normally would, you’re making the brain work harder to keep you balanced — training it. And the more you do this the better your brain becomes at keeping you upright. Below are some demonstrations of balance and core strength exercises that you can easily do at home. These exercises are very gentle and simple and can be done around the house and even while watching TV. Before doing any exercise, it is important to warm up first with just a couple of minutes of gentle movement of the muscles you are about to use, so try marching on the spot for 1 – 2 minutes, add in arm swings for that extra effort! If you need support to stand, try the kitchen table or any walking aids that you might use. Stretch your neck by standing tall, feet hip-width apart and then turn your head slowly to the left, right, up and down – using your fingers on your chin to help stretch out the neck. Do this 5 times if possible. Stretch your back out by slowly arching back while looking forward and by turning your upper body left and right (with your hips and feet not moving). Repeat this 5 times. Next your ankles – Sit on a chair, with your back fully supported, stretch one leg out and then point your toes away from you and then back towards you. Next you want to improve your strength and again there are some easy exercises. With time you can start to use ankle weights if you want to improve the benefit you get from the exercises. Again, sitting in a chair comfortably, with your back supported, sweep your foot along the ground and out, but be careful not to lock your knees. Then lower the foot and repeat. Try to raise your foot slowly over a count of three and then lower over the count of 5. Repeat this ten times on each leg. Next, strengthening the back of the knees. Standing out of the chair, stand behind it or use a table for support. Brush one foot backwards and then lift the foot from the floor. Keep your knees together. Then lower your leg again and repeat on each leg ten times – lifting over a slow count to three and lower over a low count to 5. Onto your hips next – stand behind the chair or table again as support and keeping your back straight, lift one leg out sideways slowly while counting slowly to three. Lower the leg while counting slowly to 5 and then put your foot back on the ground and rest. Repeat this 10 times on each leg. At this point if you are wearing ankle weights take them off. Finally strengthen your feet. Again, supporting yourself at the table or against a chair. Keep your feet hip-distance apart and slowly lift yourself onto your toes. Lift over the count of 3 and lower over a count of 5. Repeat this 10 – 20 times. When you are finished with heel raises, stand in the same position and lift your toes, putting all your weight on your heels. Again, raise over the count of three and lower during a slow count to 5. Like the heel lifts, do these 10 – 20 times. Now you are warmed up and strengthened – it is time to work on balance. These can be done with support if you need it. A table, a steady chair or even the sink can be really useful for this. Hold onto your support when you need to. With time, when you balance increases, you will find yourself needing less and less support. Make sure your floor is clean and sturdy so you are not likely to slip or trip on anything. Knee bends – keep your knees and feet hip-distance apart and then push your bum out as if you are going to sit down. Make sure your knees don’t turn in and that your heels stay on the ground. Repeat this 10 times. Again, using support where you need it, try taking 10 steps on your toes. Make sure you control you movements. Bring both feet level before you lower them to the floor, then turn around and walk back again. Place one foot in front of the other with the toes of one foot touching the heel of the other – now look ahead and balance for 10 seconds. But your feet back together and then swap the feet around and do it again. Trying walking with one foot directly in front of each other. i.e. : the heel of one foot should touch the toes of the foot behind for each step you take. Make sure you stay in a steady line. Walk 10 steps and then put your feet back together, turn around and do it again. Next, try balancing on one leg. Make sure you keep your knees relaxed and lift one foot a little – try and hold it for 10 seconds, lower your foot and repeat on the other leg. Now, stand with your feet hip-distance apart and stand tall. Now, using support if needed, take 10 sideways steps and then repeat in the opposite direction. Move on to ‘penguin walking’. This is where you walk on your heels keeping your toes pointed up for 10 steps. Make sure you look ahead and not at your feet. Stop, bring your feet together and lower, turn around after 10 steps and then do it all again walking the other way. The next exercise can be done with or without your hands. Sit tall near the front of a chair. Then slowly stand up (use your hands if needed). Walk backwards until your knees hit the back of the chair. Then slowly lower your bottom back onto the chair. Repeat this 10 times. Now we make it a little more challenging and go backwards. Looking straight ahead of you, take ten steps backwards while standing tall. Put your feet back together, turn around and repeat in the other direction. Next try taking ten steps backwards while using your toes to touch the heel of the foot in front of it with each step. Then turn around and take another ten steps. Using chairs, if you have them, walk in a figure of 8 around them. To avoid getting dizzy do this exercise slowly and only twice. Finally stair walking. This is a great way to get fit. Walking up the stairs, try to rely on the rail less than normal if you can. Going up, place your strongest leg on the step first. Throughout the stair climb, look down with your eyes (don’t bend your hips) and check the position of your feet. When you get to the top of the stairs turn around and then use your weaker leg to lead the way down the stairs. Repeat 5 times or until your legs start to get warm. You should aim to do these types of exercises 2-3 times per week. Professor Dawn Skelton from Glasgow Caledonian University says that within 3 -4 weeks you will start to feel real benefits. If you’re really struggling with your balance and experiencing regular dizziness, then it might be that you’re suffering from a balance disorder such as BPPV – more commonly known as vertigo. These are usually easily treatable and you should talk to your GP. There are a whole range of other exercises you can do to improve balance generally, such as dancing, swimming, tai chi or yoga. The key to success is finding ways of integrating into your daily routine – so you could try brushing teeth on one leg or training yourself to balance on one leg with your eyes closed. They’re simple to do and could make a big difference.